Mediated Discourse as Social Interaction makes an explicit link between media studies and social interactionalist discursive research where previously the two fields of study have been treated as separate disciplines. This text presents an integrated theory illustrated by ample concrete examples, bringing together the latest research in these two fields. 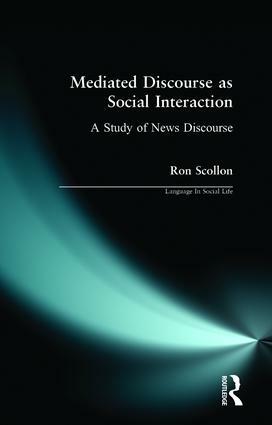 It offers a critique to the sender-receiver model implicit in media studies, and argues for an analysis of media discourse as social interaction, on the one hand among journalists and newsmakers as a community of practice, and among readers and viewers as a spectating community of practice on the other. The book also argues for a coherent and interdiscursive methodology for the ethnographic study of the role of the news media in the social construction of identity and is based on a considerable body of ethnographic and textual analysis of both print and television news media. The theory of mediated discourse presented in this volume will be of great interest to advanced undergraduates and postgraduates studying media studies, sociology of language, discourse analysis, interactional sociolinguistics, ethnography of communication and applied linguistics. It will also be welcomed by scholars and professionals involved in research in these areas. The late Ron Scollon was a Professor in the Department of English, City University of Hong Kong.